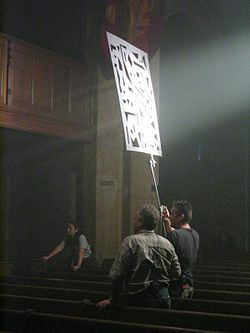 Illustration of a gobo in front of a light source. A cookie in action: similar to a gobo but not as close to the light source. The tutorial is based on the code of Section “Smooth Specular Highlights” and Section “Transparent Textures”. If you haven't read those tutorials yet, you should read them first. In real life, gobos are pieces of material (often metal) with holes that are placed in front of light sources to manipulate the shape of light beams or shadows. Cookies (or “cuculoris”) serve a similar purpose but are placed at a larger distance from the light source as shown in the image to the left. In Unity, a cookie can be specified for each light source in the Inspector View when the light source is selected. This cookie is basically an alpha texture map (see Section “Transparent Textures”) that is placed in front of the light source and moves with it (therefore it is actually similar to a gobo). It lets light pass through where the alpha component of the texture image is 1 and blocks light where the alpha component is 0. Unity's cookies for spotlights and directional lights are just square, two-dimensional alpha texture maps. On the other hand, cookies for point lights are cube maps, which we will not cover here. In order to implement a cookie, we have to extend the shader of any surface that should be affected by the cookie. (This is very different from how Unity's projectors work; see Section “Projectors”.) Specifically, we have to attenuate the light of each light source according to its cookie in the lighting computation of a shader. Here, we use the per-pixel lighting described in Section “Smooth Specular Highlights”; however, the technique can be applied to any lighting computation. Apart from the definitions of the uniform _LightMatrix0 and the varying positionInLightSpace and the instruction to compute positionInLightSpace, this is the same vertex shader as in Section “Smooth Specular Highlights”. Instead of vec2(positionInLightSpace) we could also use positionInLightSpace.xy to get a two-dimensional vector with the x and y coordinates in light space. Note that the texture lookup for directional lights can also be implemented with texture2DProj by setting textureCoords to vec3(vec2(positionInLightSpace), 1.0). This would allow us to use only one texture lookup for both directional lights and for spotlights, which is more efficient on some GPUs. // spotlight (i.e. not a point light)? Note that the cookie for a point light source is using a cube texture map. This kind of texture map is discussed in Section “Reflecting Surfaces”. How to implement cookies for directional light sources. How to implement spotlights (with and without user-specified cookies). How to implement different shaders for different light sources. about the shader version for lights without cookies, you should read Section “Smooth Specular Highlights”. about texture mapping and in particular alpha texture maps, you should read Section “Transparent Textures”. about projective texture mapping in fixed-function OpenGL, you could read NVIDIA's white paper “Projective Texture Mapping” by Cass Everitt (which is available online).